I have been super busy making some things to share with you & running around like a crazy woman for my kiddos! School is almost over but it seems that I'm more busier than ever so excuse my tardiness from time to time! I'm sharing with you a quick card I threw together using another cute sketch I found! I used my fave go to stamp set Elements of Style & water colored those gorgeous flowers....it's funny to me how early espresso came out looking a bit purple!!! Anyway, enjoy my creativity please & I'll be back on Sunday with my first post as a Design Team member for 613 Avenue Create! It's a beautiful card and a great take on the sketch challenge. 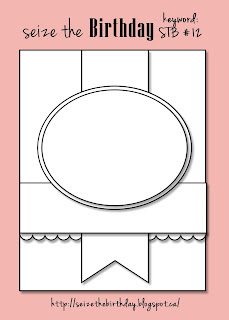 I like your choice of dark color for the fishtail banner and oval frame against the softer colors of the rest of your card - the contrast has a really nice effect! Beautiful card! Love that great design and that pretty butterfly!! Gorgeous card!! Thank you for playing along with my Flutter By Wednesday Challenge!! darling! thanks for playing along at seize the birthday! Oh I love the lace for one of the panels! Get take on the sketch!! Thanks for joining the DRS Designs challenge! Hey There Jackie, Love that rich brown and your pretty flowers. This is gorgeous. 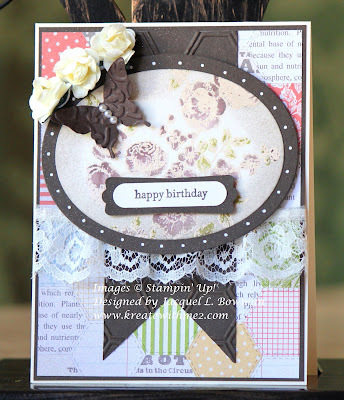 Beautiful card and I love the patterned paper you used on this. Beautiful card! Love the lace and embossed butterfly! Your card is absolutely beautiful. Great take on the sketch. a marvellous take on the sketch! Love the lacy look...very springy and pretty Jackie! Thank you for joining us at Seize the Birthday! Jackie this card is beautiful - so feminine and classy! Beautiful card!! I love the lace and butterfly. Love all the different papers you used..how fun. Thanks for joining us this week at Seize the Birthday. Gorgeous watercoloring, Jackie! Love the sketch too, adding the lace as one element is really pretty. Congrats on the DT!!! Can't wait to see what beauties you have to share with the rest of us. Such a lovely card with such gorgeous colors and fabulous job on the layout. Stunning! It has a lovely vintage feel. The colours are perfect. Beautiful and so well done! 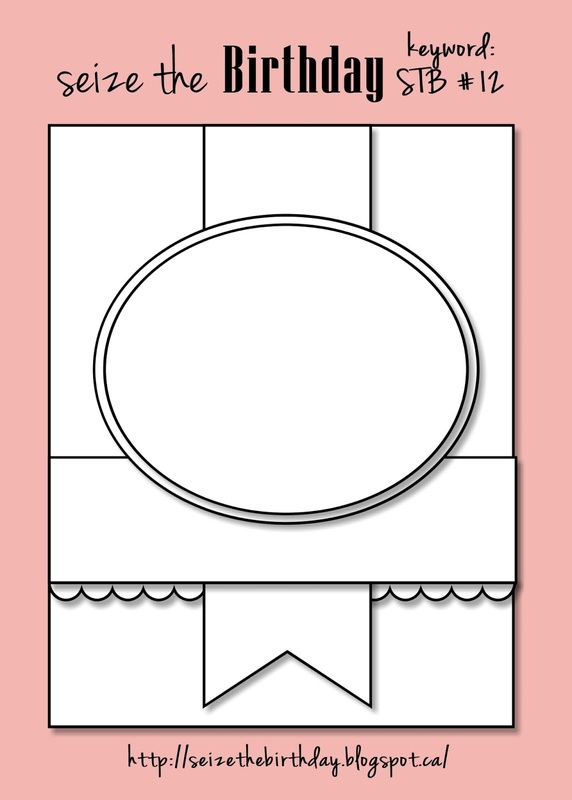 Thanks for playing along withe the DRS Designs Paper Flowers challenge. Good Luck!